This is a critical time of the year for red squirrels as the young, called kits, will now be in their nests, called dreys, normally in trees. The dreys are generally high in trees and close to the trunks and are easily overlooked as they blend in with their surroundings. The kits will have been born in a drey that has been modified with a thick grassy lining and is tight up against the trunk of a tree. The kits are born blind and naked but the growth is very rapid and they begin to leave the nest at about 7 weeks old and are fully weaned in 8-10 weeks. The male takes no part in the rearing. If something disturbs the breeding drey the female will carry the kits, one at a time in her mouth, to a nearby drey. If the food supply is good the older squirrels will have two broods of kits each year. The young are most vulnerable during the first few months and it is estimated that about 80% do not survive their first year. There are many readers that now feed peanuts to red squirrels in their gardens all the year round in feeders designed for them with a glass or plastic front and a hinged lid. The front is so the animals can see the food, although it is likely they can smell the nuts anyway, and the hinged lid is soon mastered. 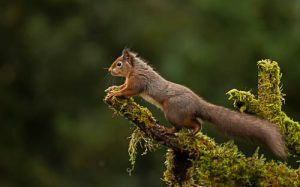 What surprises people is the variation in range of the colours of the red squirrels coats. The summer coat of the adult is bright chestnut with orange brown feet and lower legs. Its ears are tufted and the bushy tail often turns to a pale creamy colour as the summer goes by. In contrast the winter coat is chocolate brown with the fur on the back looking dark grey. The body fur moults in spring and summer and is very unusual in that it moults from the front to the back in the spring and from back to front in the autumn. Most true albino red squirrels, with their characteristic pink eyes, have been seen in Scotland and also very dark brown specimens occasionally occur. People are also often surprised at the range of food that red squirrels take apart from the traditional cones. Cones are a good way of finding out where red squirrels are as under conifers, especially Scots pine, although they will also freely take larch and spruce, you can see where the animals have been feeding. The cones are stripped to the core and just left on the ground. However, they not only take cones but also leaf and flower buds, shoots and needles, pollen from male flowers and sappy tissue under bark. They will also take a variety of other food such as fungi, berries, fruit and occasionally eggs and young of birds. A recent innovation, although the red squirrels have no doubt always been doing it and we had not noticed, is their liking of chewing deer antlers. Other animals will chew antlers and in my collection I have a huge red deer antler from the Isle of Rum, taken away with permission, that has been chewed by red deer stags. I also have a photograph of a red deer hind on the island that was chewing an antler. Mice and other animals will also chew antlers, presumably for the calcium. One reader near Inverness put out two red deer antlers on trees next to two peanuts feeders that were in daily use by at least three red squirrels. For some reason it took several weeks to catch on but now they chew the antlers on almost a daily basis. This entry was posted on Tuesday, May 17th, 2016 at 8:10 pm and is filed under Wildlife in the North .